Do you want to know where you can find the best gluten free in California? Search no further! 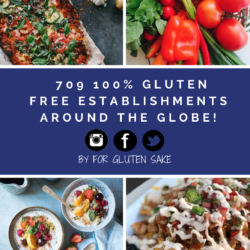 Follow For Gluten Sake and find the best 100 percent gluten free places around the globe, so that you can get out there, travel, and BE FREE FOR GLUTEN SAKE! Bringing you Snackin’ Free: 100 Percent Gluten Free California. For years I thought people that watched what they ate were a little crazy. They were a little too “out there.” Until I was diagnosed with celiac disease and I finally began to understand the enormous connection food has to our health. Laura has an interesting story, like so many of us, between food and her health. Enjoy this great interview with Laura of Snackin’ Free! Hi, my name is Laura Savinovich. I am the founder of and head baker at Snackin’ Free, a completely dedicated gluten, grain, dairy, soy and peanut free bakery-cafe in Murrieta, CA. I started on this journey after suffering for several years with pain, weight gain and severe fatigue associated with Rheumatoid Arthritis. I decided to do some extensive research before jumping in with both feet, clearing all the cupboards, and disrupting everyones life; but I soon found that finding tasty foods that adhered to my new strict dietary guidelines proved very difficult so I knew I had to make it myself.